Margaret Nevill was the daughter of Henry Nevill. She married Sir Baldwin Conyers, 4th Bt., son of Sir John Conyers, 3rd Bt.. Her married name became Conyers. Child of Margaret Nevill and Sir Baldwin Conyers, 4th Bt. Henry Nevill lived at Holt, Leicestershire, EnglandG. Christian Anstruther was the daughter of Sir Philip Anstruther and Elizabeth Hamilton.1 She married, firstly, Sir William Weir, 2nd Bt.1 She married, secondly, John Stewart, 6th Earl of Traquair, son of Charles Stewart, 4th Earl of Traquair and Mary Maxwell, in 1740.1 She died on 12 November 1771. Her married name became Weir.1 From 1740, her married name became Stewart.1 After her marriage, Christian Anstruther was styled as Countess of Traquair on 24 April 1764. Child of Christian Anstruther and Sir William Weir, 2nd Bt. [S15] George Edward Cokayne, editor, The Complete Baronetage, 5 volumes (no date (c. 1900); reprint, Gloucester, U.K.: Alan Sutton Publishing, 1983), volume IV, page 366. Hereinafter cited as The Complete Baronetage. Sir William Weir, 2nd Bt. 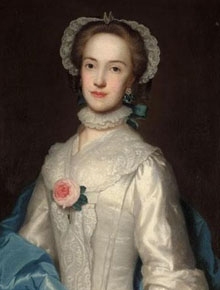 married Christian Anstruther, daughter of Sir Philip Anstruther and Elizabeth Hamilton.1 He died before 1740. Mary Ravenscroft was the daughter of George Ravenscroft and Mary Slater.1,2 She married Charles Stewart, 7th Earl of Traquair, son of John Stewart, 6th Earl of Traquair and Christian Anstruther, on 19 August 1773, by special licence.1 She died on 11 July 1796 at Madrid, SpainG. Her married name became Stewart. After her marriage, Mary Ravenscroft was styled as Countess of Traquair on 28 March 1779. [S5599] Kathy Wilson, "re: Ravenscroft Family," e-mail message to Darryl Roger LUNDY (101053), 30 August 2011. Hereinafter cited as "re: Ravenscroft Family."